In my previous article, in this series on parenting anger, I talked about the Parenting Anger Escape Door and hinted to the fact that it is “a gateway to developing godly character in both you in your children.” Once I discovered how God’s escape door for my ugly anger episodes could actually help both me and my children, I have never looked at my sinful nature the same. I hope what I have to share with you below will leave you feeling the same about your struggle and encourage you to keep pressing on. Yes, God makes wonderful masterpieces out of life’s messes, and I am excited to share with you how He does just that with our misdirected parenting anger. Once I started training myself to not pick up the rope and instead turn to braiding the whip (if you don’t know what I am talking about, you will have to go back to the previous article in this series), my parenting vision cleared up considerably. 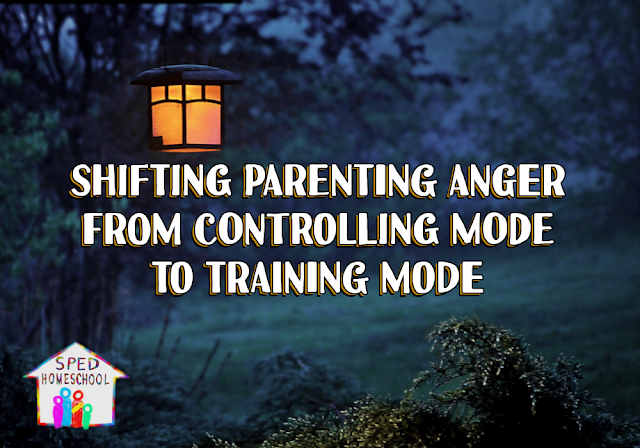 Anger had blurred my perception of effective parenting strategies. Instead of working productively to train my children, my desire to control their actions slowly crushed their spirits. When I finally stepped back, it was glaringly clear how much I needed to change my approach. But checking our own behavior is only half the battle. The other half comes when we confront training our children due to the lack of character we are alerted to in their lives. A lack of godly character will always make our internal righteousness meter go haywire. This is God’s way of showing us we need to take notice of a situation which lacks godly character. And, if you remember from the last article in this series, indicates a lesson needs to be taught. Taking God’s parenting anger escape door leads us to the perfect starting place where this character training lesson should start. We first pray and use our energy to seek God and His training lesson, and in doing so we discover the most impactful and eventually fruitful way to help our children develop strong godly character. When I am speaking to a group and get to this part in my talk, I take out three objects: a shoebox, a flat piece of cardboard, and a ping-pong ball. First, I show my audience how the ping-pong ball is extremely difficult to keep on top of the flat piece of cardboard. I point out how the lack of edges on the board leaves nothing to stop the ball from going off the edge. Then, I contrast that example with a ping-pong ball being securely held inside the shoebox, making sure to point out the high sturdy sides that allow this containment. I use these examples because I want parents to understand that as we teach our children lessons in godly character, we are essentially giving them a building block to add to their natural boundaries. For a child instructed in righteousness, and given lots of building blocks, they instinctively know when to stop (just like the ping-pong ball) because those walls have been built over time and through many independent lessons that have stacked up sturdy boundaries for godly living. But, for a child who is only held back from the edge and controlled from doing wrong, they are not provided those blocks and instead when left without someone to hold them back from the edge will topple off just like the ping-pong ball on the flat piece of cardboard. My demonstration may seem too extreme for those of you who have a younger child who is still close by and working on these skills, but when your child grows into his/her teen years and then moves into adulthood, you will realize how critical it is to have laid boundaries with strong and solid blocks of godly character. Those boundaries will spare you and your child much larger heartaches and pain than the training process could ever bring into your lives. In my next article, I will be giving you some very practical how-to instructions on instilling godly character into your children using these blocks. But, in the meantime keep working on walking away from the rope, braiding the whip and seeking God for a clearer vision of how He is alerting you to character flaws through your natural anger meter. With a resolute desire to seek His escape door and readiness to grow in godly character along with your children, you will be well on your way to conquering your parenting anger.